In 1847, Louis-François Cartier took over the helm of his master, Adolphe Picard’s, Paris workshop at 29 Rue Montorgueil, and the jewelry house of Cartier is born. It did not take long for Cartier’s designs to attract high wattage customers, with Empress Eugénie, wife of Emperor Napoleon III, becoming a Cartier client in 1859, soon to be followed by many of her aristocratic peers. In 1874, Alfred Cartier, son of Louis-François, takes over the Cartier business from his father, and continues to build the Cartier brand, developing the first women’s bracelet watch, in 1888, effectively merging his interests in both jewelry and watchmaking. To make room for the expanding business, Alfred moved the workshop to the house’s current Paris headquarters at 13 Rue de la Paix, sparking a trend of other jewelers and luxury brands moving into the area. In 1902, Pierre Cartier, the second of Alfred Cartier’s three sons, opens a Cartier branch at 4 New Burlington Street in London. Edward, Prince of Wales, orders 27 Cartier tiaras for his upcoming coronation. He later issues a royal warrant, making Cartier an official purveyor of jewels to the crown, beginning Cartier’s long relationship with the House of Windsor. Fourteen more royal warrants will follow in the next quarter century, including royal families of Russia, Siam, Serbia, and Portugal. Louis Cartier, Alfred’s eldest son and director of the firm’s Paris operations, creates one of the first wristwatches for his friend, Brazilian aviator Alberto Santos-Dumont, who had complained to Louis about the difficulty of checking a pocket watch while flying. Louis designs the watch with Santos’s input in 1904. The leather-strapped Santos watch, launched commercially in 1911, is still in production today. Louis continued to build Cartier’s watch heritage with the development of the original Tank watch in 1917, inspired by the military tanks newly introduced on the Western Front. 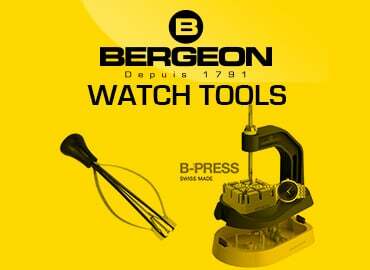 The watch was officially launched in 1919, and remains one of the maison’s most enduringly popular designs. 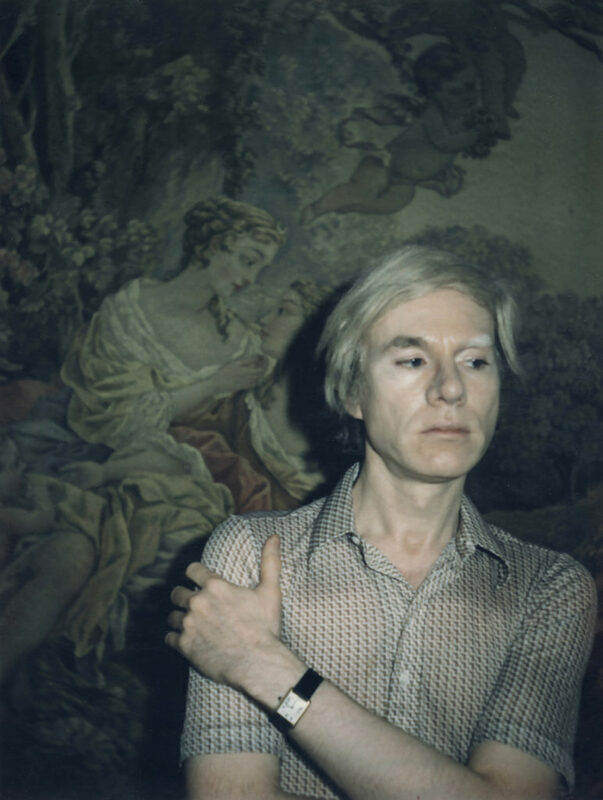 Yves Saint Laurent, Andy Warhol, Jackie Kennedy Onassis, and Michelle Obama, who wore a Tank Française in her official White House portrait in 2013, have worn the Tank. 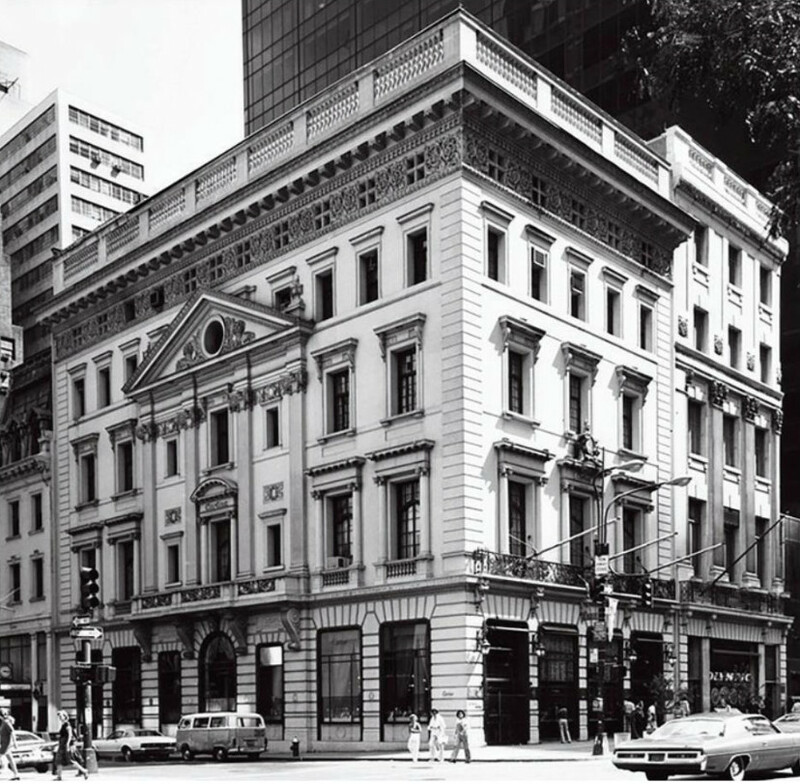 Jacques, the youngest of Alfred Cartier’s three sons, took over the operations of the London branch in 1906, opening a second London location at 175-176 New Bond Street. Meanwhile, Pierre, sensing a growing opportunity in the rising prominence and wealth of American industrialists and entrepreneurs opens an American branch in New York City, at 712 Fifth Avenue in 1909. His instincts were proven correct the following year with the sale of the famed 45.5-carat Hope Diamond to American Evalyn Walsh McLean. 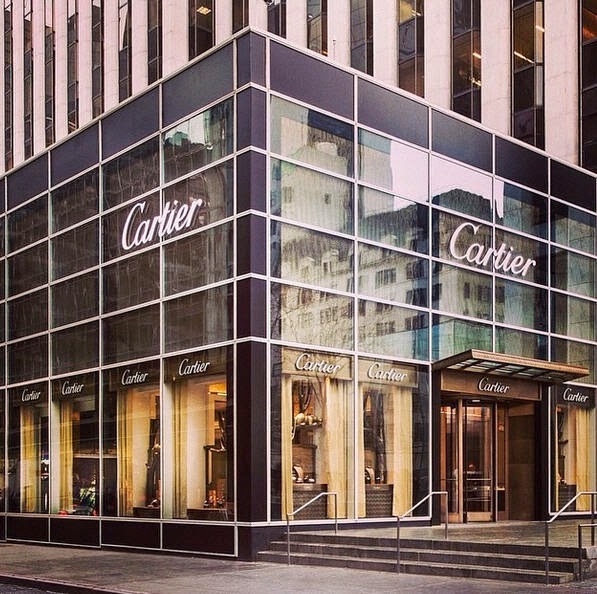 In 1917, Pierre moved Cartier’s New York operations to I ts current location at 653 Fifth Avenue. Pierre purchased the limestone mansion, designed in the Italian Renaissance style in 1905 by Robert W. Gibson, from the industrialist and yachtsman Commodore Morton F. Plant for $100 cash and a double-strand pearl necklace valued at $1 million. 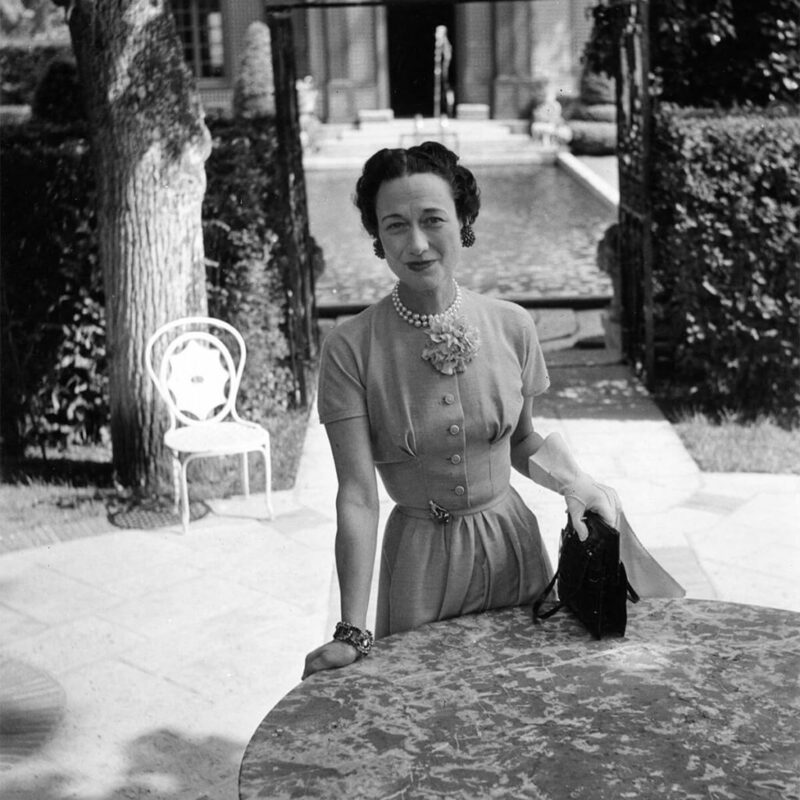 Plant’s wife, Maisie, had admired the necklace of 128 perfectly matched natural pearls in the window of the Cartier workshop at 712 Fifth Avenue (now part of Henri Bendel,) and convinced her husband to trade their home for the necklace. Pierre brought on architect William Welles Bosworth, who had recently spearheaded the renovation of the American Telephone and Telegraph Building at 195 Broadway, to transform the stately home into a boutique and headquarters for the jeweler’s American operations. Pierre would remain head of Cartier New York until taking over Cartier Paris after the deaths of his brothers in 1945. In 1924, Cartier debuted the three-band “Trinity de Cartier” collection. 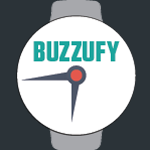 The design is known as the “Rolling Ring” in France. 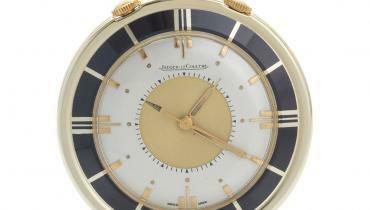 The French poet, director, and artist, Jean Cocteau, helped Louis Cartier develop the design, and popularized the Trinity collection among his Parisian society peers. The collection is still in production today. 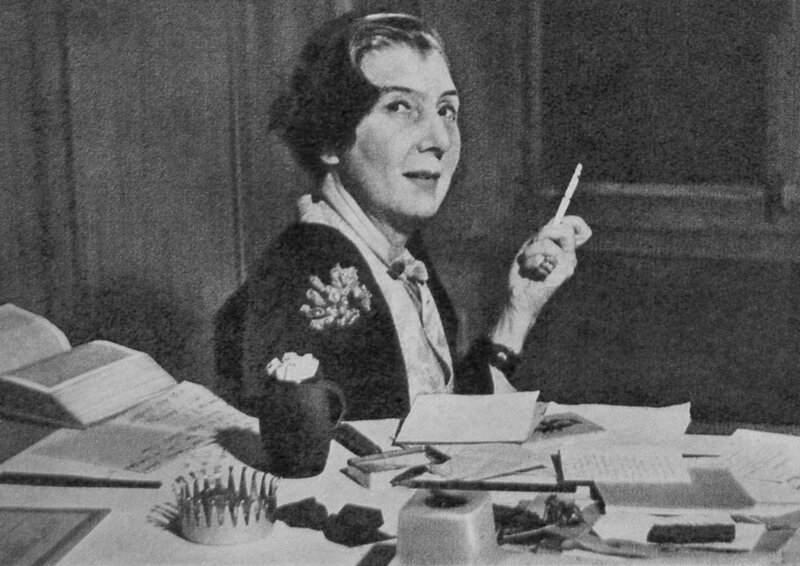 In 1933, Louis Cartier promoted one of his jewelry designers, Jeanne Toussaint, to head Cartier fine jewelry. Nicknamed “La Panthère” for her feminine sensibility and known as “the Coco Chanel of jewelry,” Toussaint went on to create many of Cartier’s most iconic fine jewelry designs. 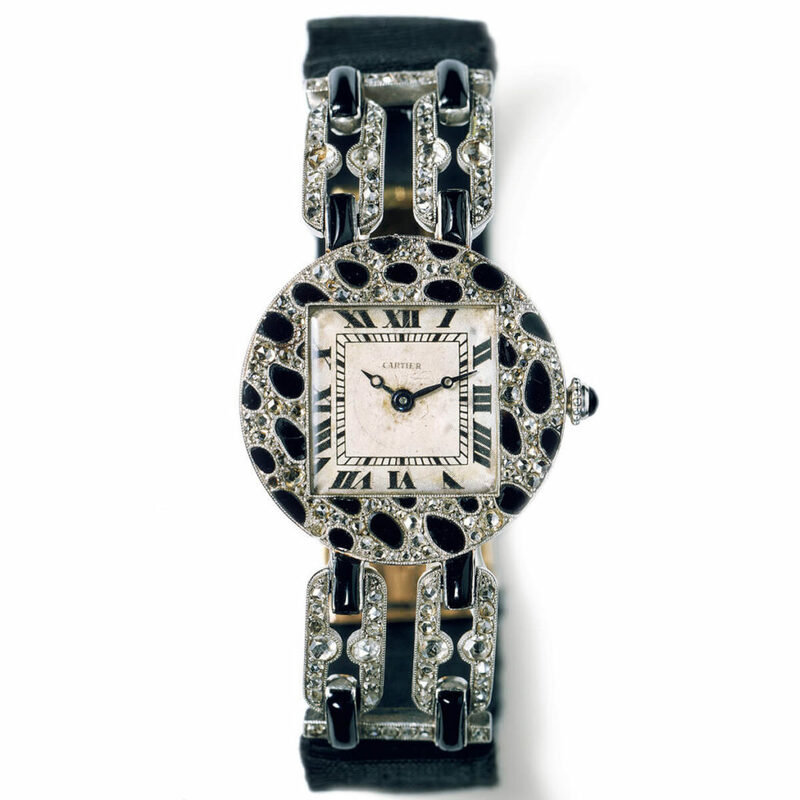 Toussaint developed Cartier’s first panthère motif, a leopard print paved with diamonds and onyx on the bezel of women’s wristwatch, after a trip to Africa with Louis Cartier. Her iconic animal designs, including parrots, flamingos, and the panthère, were coveted by royalty. 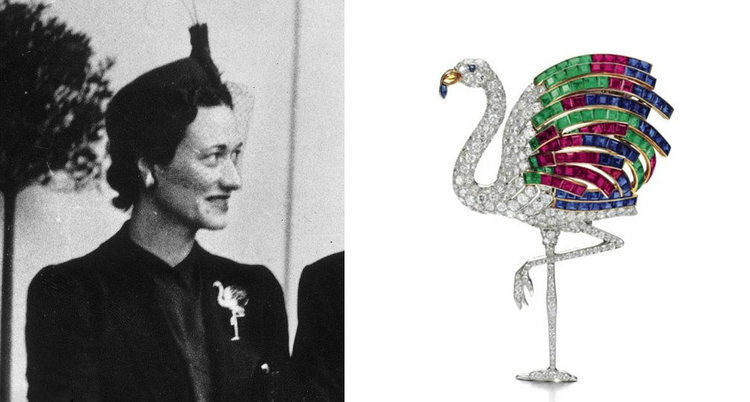 In 1940, the Duke of Windsor had Toussaint reassemble an existing necklace and four gemstone bracelets into a flamingo brooch for Wallis Simpson. 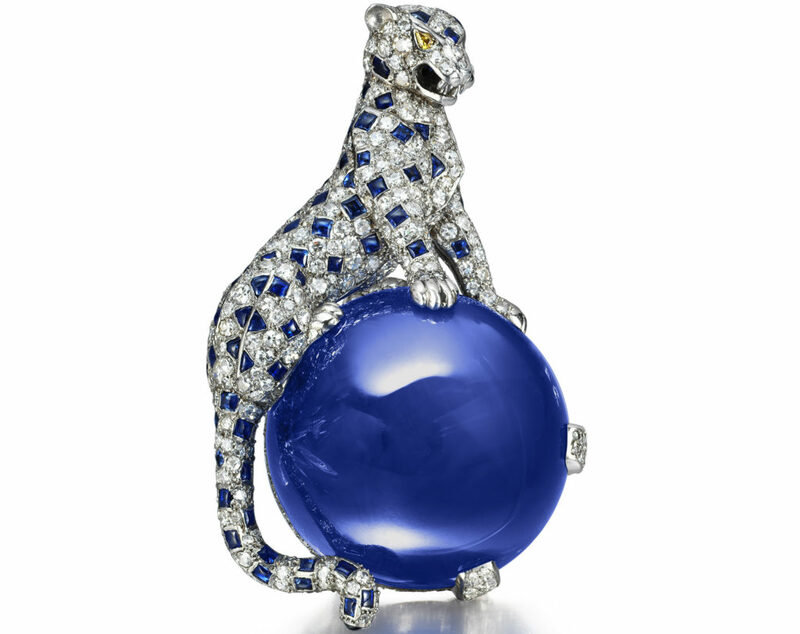 The couple purchased a panthère brooch featuring the platinum-and-diamond-encrusted animal perched atop a 152.35-carat cabochon sapphire, one of Simpson’s favorite pieces from Cartier in 1949. 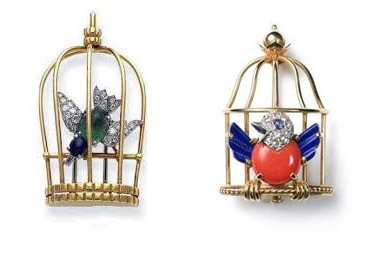 During World War II, Toussaint designed a jeweled brooch featuring a songbird in a cage as a symbol of protest against the Nazi occupation of France, produced with limited materials due to wartime shortages. Louis Cartier offered his London offices as a home base for General Charles de Gaulle’s “Free France” movement. Many of de Gaulle’s wartime speeches were written in Cartier’s London headquarters. To celebrate the war’s end in 1944, Toussaint designed the “Oiseau Libéré” brooch, with a now joyful songbird freed from his cage. In 1945, the fourth generation of the Cartier family rises to the forefront after death of Louis and Jacques Cartier. Claude, Louis’s son, helms Cartier New York, and Jean-Jacques, Jacques’s son, takes over Cartier London. 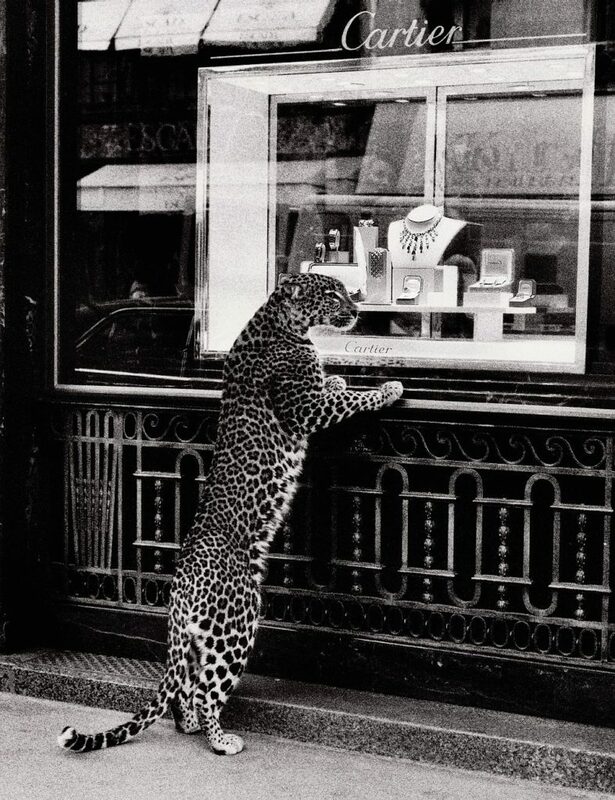 Pierre’s daughter, Marionne Claudelle, later takes over Cartier Paris after Pierre’s death in 1964. In 1953, Cartier’s place in Hollywood legend and popular culture is cemented when Marilyn Monroe sings “Cartier!” in the film adaptation of Anita Loos’s Gentlemen Prefer Blondes. The firm’s jewelry first appeared in its iconic red box in the original Broadway production in 1926. 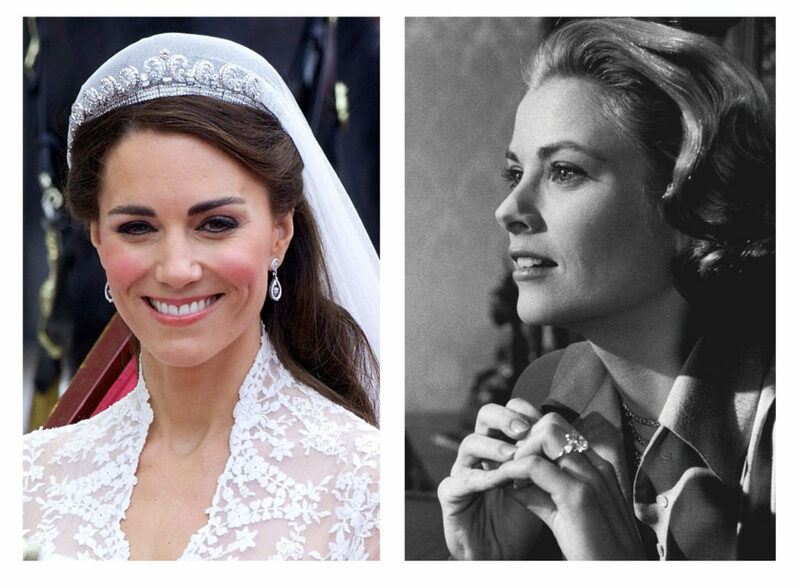 In 1956, Prince Ranier III of Monaco proposed to the American actress Grace Kelly with a 10.47-carat emerald cut diamond ring from Cartier. Kelly had been a Cartier client for years after being introduced to the maison by director Alfred Hitchcock. Ranier’s family, the Grimaldis, had originally issued a royal warrant to Cartier in 1920. Kelly wore a suite of Cartier diamond jewelry for her wedding on April 19, 1956. 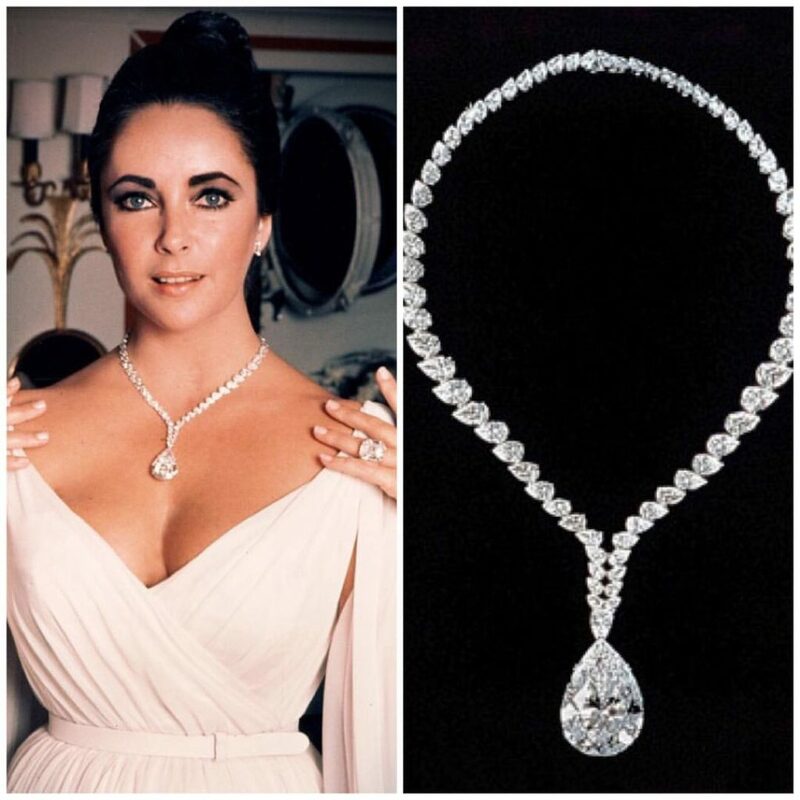 Cartier would continue its relationship with doyennes of the silver screen, later creating a serpent-shaped diamond necklace for Mexican actress Maria Félix in 1968, and selling a 69.42-carat pear-shaped diamond to Richard Burton, who bought the stone as a birthday gift for Elizabeth Taylor in 1969. The stone was renamed the Taylor-Burton diamond. 1969 also marked the original launch of the Love bracelet, which was created by in-house designer and 70’s icon, Aldo Cipullo. The lower-priced collection included cigarette lighters and the first line of leather goods in the house’s signature Bordeaux red. The Kanoui-led group went on to purchase Cartier’s London operations in 1974 and New York in 1976. The Cartier interests were combined into “Cartier Monde” (meaning “Cartier World”) in 1979. In 1981, Cartier Monde and Les Must de Cartier were merged into Cartier International, and Perrin was named Chairman of the newly formed entity. Under new financial leadership, the Cartier business flourished, as the Must product line grew to include silk scarves in 1978; the first Cartier perfumes, “Must de Cartier” and “Santos de Cartier”, in 1981; and a collection of porcelain, crystal, and silverware, called “Les Maisons de Cartier” in 1987. The entry-level price points for these items allowed a new group of customers access to the Cartier brand, raising Cartier’s profile. 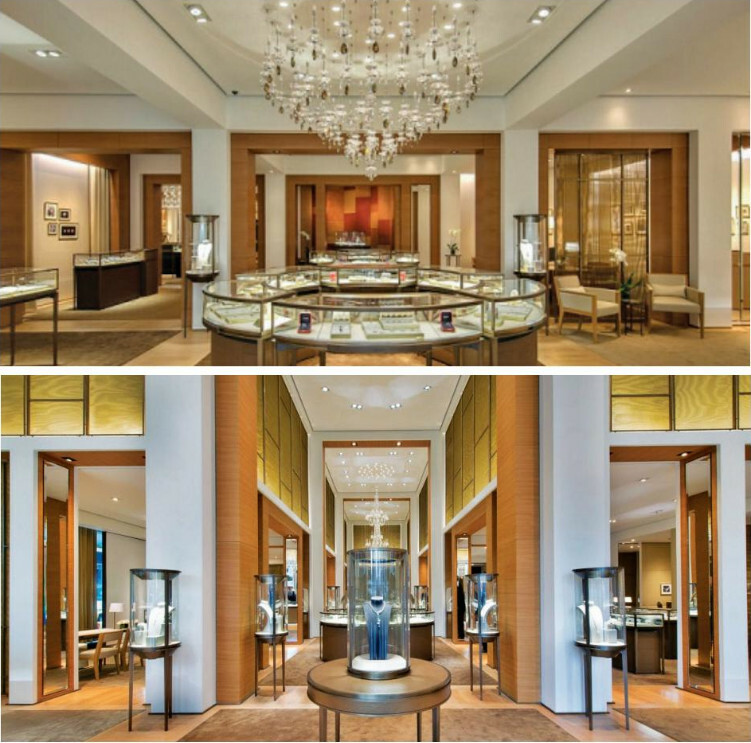 This effort worked in tandem with massive retail expansion, as a slew of new Cartier boutiques opened worldwide. To boost its watchmaking business, Cartier also acquired majority stakes in watchmakers Piaget and Baume and Marcier in 1988. Simultaneously, the new Cartier leadership worked to cultivate the brand’s rich heritage. Michelle Kanoui, the recently named head of jewelry design debuted her first collection for Cartier in 1982. Her collection, “Nouvelle Joaillerie,” was inspired by the brand’s Paris lineage and drew on many of Jeanne Toussaint’s iconic designs of the early 20th century. In 1984, Perrin founded the “Foundation Cartier pour I’Art Contemporain,” a foundation for contemporary art, to strengthen ties between the maison and artists of the time. This effort culminated in the 1989 retrospective of the Cartier collection, called “L’Art de Cartier,” staged by the Musée du Petit Palais in Paris. The exhibit displayed jeweled creations dating back to the maison’s founding and included pieces from Cartier’s archives as well as items on loan from their royal owners. The exhibition was later shown at the Hermitage Museum in Saint Petersburg in 1992, the Tokyo Metropolitan Teien Art Museum in Tokyo in 1995, the Museo del Palacio de Bellas Artes in Mexico City in 1999, the Shanghai Museum in Shanghai in 2004, and the Deoksugung National Museum in Seoul in 2008. In the early 2000’s Cartier moved to make its jewelry supply chain more transparent. In 2001, the maison adopted the Kimberly Process, an industry-wide effort to end trade in conflict diamonds. In 2005, along with thirteen other jewelry industry leaders, Cartier co-founds the Council for Responsible Jewelry Practices, which sets standards for responsible business practices for each step of the jewelry supply chain for its 850 member companies. In 2011, Kate Middleton wore a diamond and platinum Cartier tiara with foliated scrolls, known as the “Halo Tiara,” for her wedding to Prince William. The tiara was originally created in 1936 for Queen Elizabeth II, then the Duchess of York, and was also worn by Princess Margaret in 1955. In 2012, Cartier debuted L’Odyssée de Cartier, a three-and-a-half minute long film that took two years and $5.3 million to produce. The film starred real panthers and was directed by Bruno Aveillan. Cartier hosted a premiere at the Metropolitan Museum of Art in New York to screen the film, which celebrated Cartier’s 165th anniversary. 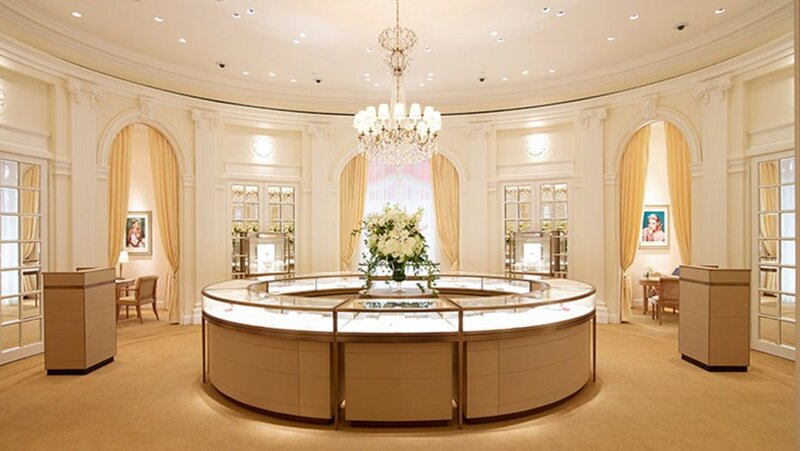 In 2014, renovations began on Cartier’s Fifth Avenue store. The design team is led by two New York-based architectural firms specializing in historic preservation. Beyer Blinder Belle worked on the 1980’s renovation of Ellis Island, and Thierry W. Despont led the 1980’s restoration of the Statue of Liberty. 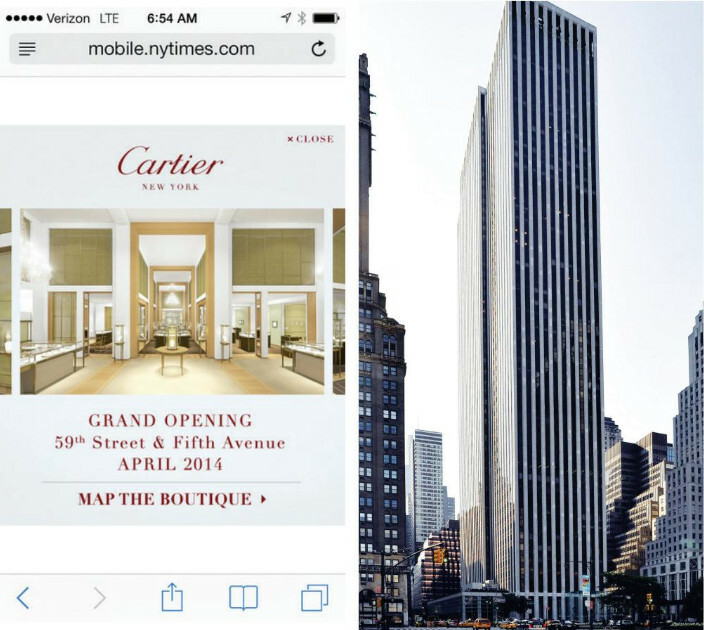 Retail operations are moved up the street to the GM Building on Fifth Avenue at 59th Street. 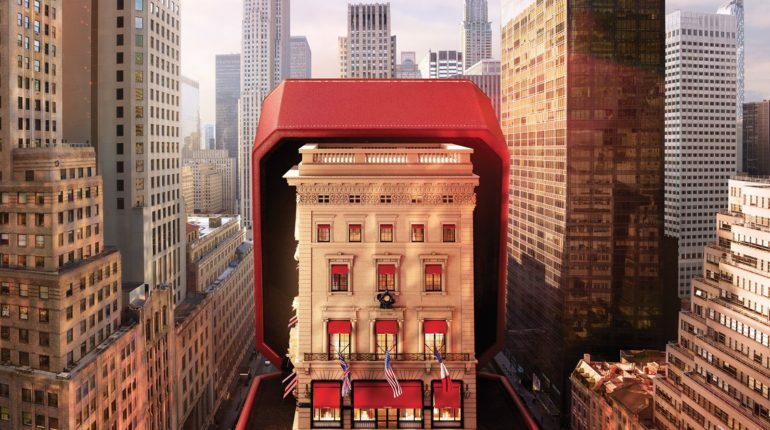 The 59th Street store opening coincides with the launch of the lower-priced “Amulette de Cartier” collection, which is featured in an accompanying interactive microsite with links to influencer content on social media on Cartier’s website and promoted with #UnlockYourWish. In September 2016, with renovations complete, the mansion reopens at Fifth Avenue and 52nd Street (officially named “Place de Cartier” in 2001.) The occasion is marked with a gala attended by Katie Holmes, Sienna Miller, Taylor Schilling, Sofia Coppola, and Rooney Mara, among others from the glitterati set. 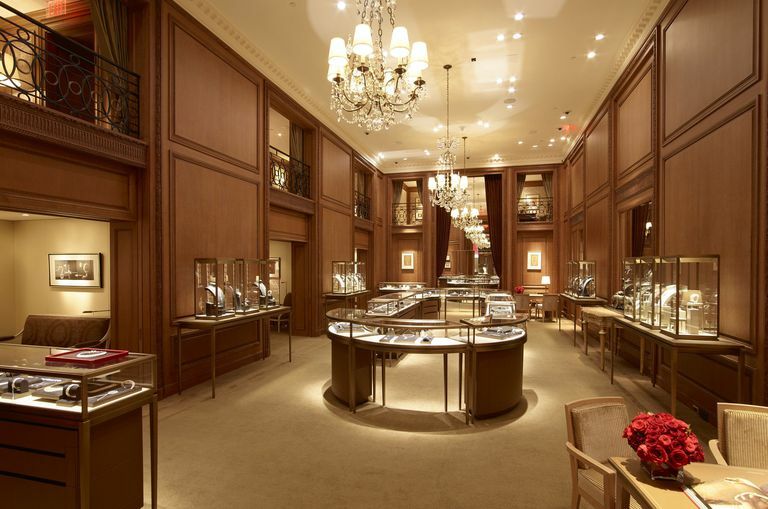 The new store offers four floors of selling space, with specialty salons named for some of Cartier’s famous clients. Private booths above the main selling floor allow sales associates to confer with high-dollar clients without being disturbed. The new store also offers Wi-Fi connectivity, iPads for inventory searches, and a mobile app designed for Apple and Android phones that offers customers a guided historical tour around the store. A portrait of the maison’s original matron, Maisie Plant, wearing her pearl necklace, hangs prominently overlooking the grand staircase.